KUALA LUMPUR, 9 May 2014 – The leaves of a plant commonly used in Malay cuisine contains an anti-oxidant that may help to protect bones from osteoporosis. A researcher from The National University of Malaysia (UKM) Dr Elvy Suhana Mohd Ramli and others found that Daun Kadok or Piper sarmentosum has the therapeutic agent to prevent bone fractures and accelerate fracture healing. Speaking to the UKM News Portal at the UKM Medical Molecular Biology Institute (UMBI) here recently, Dr Elvy Suhana said the ubiquitous plant has the ability to inhibit the expression of a gene in adipose tissue and bone which degrades bone structures and strength. Studies she and her team carried out on rats showed that anti-oxidant properties through its flavonoids compound naringenin acts as a superoxide scavenger that may help in the endogenous antioxidant defence system to protect bone against osteoporosis. Other members of the team are Prof Dr Ima Nirwana Soelaiman, Prof Dr Farihah Suhaimi, Prof Dr Srijit Das, Prof Dr Ahmad Nazrun Shuid and Dr Siti Fadziyah Mohd Asri. They focused on the therapeutic effect of daun kadok extract on fracture healing in rats which had their ovaries removed and its protective effects against glucocorticoid induced osteoporotic rats. Daun Kadok is used as an ingredient in Malay food and the traditional foods of South East Asia. It is also a form of herbal medicine used to treat many ailments such as inflammation, dermatitis and joint pain. Dr Elvy Suhana said that osteoporosis is a major global health problem characterised by the loss of bone mass and strength which leads to an increased risk of fracture, usually in post-menopausal women. Glucocorticoid treatment is the leading cause of secondary osteoporosis. Glucocorticoid action in bone depends upon the expression of 11beta-hydroxysteroid dehydrogenase type 1 enzyme (11β-HSD1). The oestrogen deficient state causes osteoporosis due to enhancement of osteoclastogenesis by oxidative stress which leads to increased bone resorption. Recent studies found that daun kadok extract has the ability to inhibit the expression and activity of 11β-HSD1 in adipose tissue and bone which restored bone structure and strength. It also accelerates fracture healing in the oestrogen deficient state through its antioxidant properties. The cost of conventional treatment is high and there are side-effects which discourage some doctors and patients from using available drugs in the market. Though herbal medicine has less side effects and is cheaper, treatment with herbal medicine needs to be explored further, she said. Dr Elvy Suhana is a lecturer in Anatomy at UKM’s Faculty of Medicine. She is also affiliated with the Department of Pharmacology at the UKM Medical Centre in Kuala Lumpur. 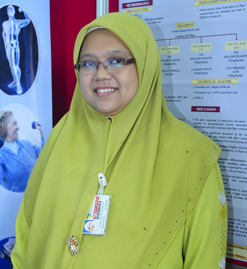 She is a member of the Bone Metabolism research group under UKM’s Health and Medical Technology Niche.